On a knotted pile carpet (formally, a "supplementary weft cut-loop pile" carpet), the structural weft threads alternate with a supplementary weft that rises at right angles to the surface of the weave. This supplementary weft is attached to the warp by one of three knot types (see below), such as shag carpet which was popular in the 1970s, to form the pile or nap of the carpet. Knotting by hand is most prevalent in oriental rugs and carpets. Kashmir carpets are also hand-knotted. Pile carpets, like flat carpets, can be woven on a loom. Both vertical and horizontal looms have been used in the production of European and oriental carpets. The warp threads are set up on the frame of the loom before weaving begins. A number of weavers may work together on the same carpet. A row of knots is completed and cut. The knots are secured with (usually one to four) rows of weft. The warp in woven carpet is usually cotton and the weft is jute. There are several styles of knotting, but the two main types of knot are the symmetrical (also called Turkish or Ghiordes) and asymmetrical (also called Persian or Senna). 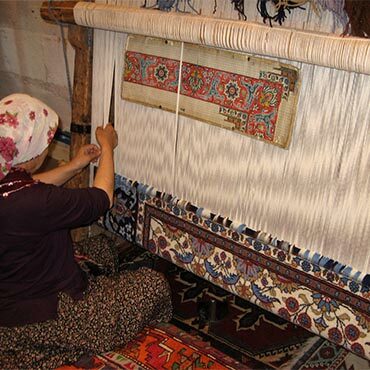 Contemporary centres of knotted carpet production are: Lahore and Peshawar (Pakistan), Kashmir (India / Pakistan), Mirzapur, Bhadohi, Tabriz (Iran), Afghanistan, Armenia, Azerbaijan, Turkey, Northern Africa, Nepal, Spain, Turkmenistan, and Tibet. The importance of carpets in the culture of Turkmenistan is such that the national flag features a vertical red stripe near the hoist side, containing five carpet guls (designs used in producing rugs). Kashmir is known for handknotted carpets of silk or wool. Child labour has often been used in Asia for hand knotting rugs. The GoodWeave labeling scheme used throughout Europe and North America assures that child labor has not been used: importers pay for the labels, and the revenue collected is used to monitor centres of production and educate previously exploited children.